We show you how to make a neat little stacks of unique soaps for your guests that will be beautiful detail in the bathroom. And somehow, even though you know what is inside, you will still enjoy opening a new bar every time. 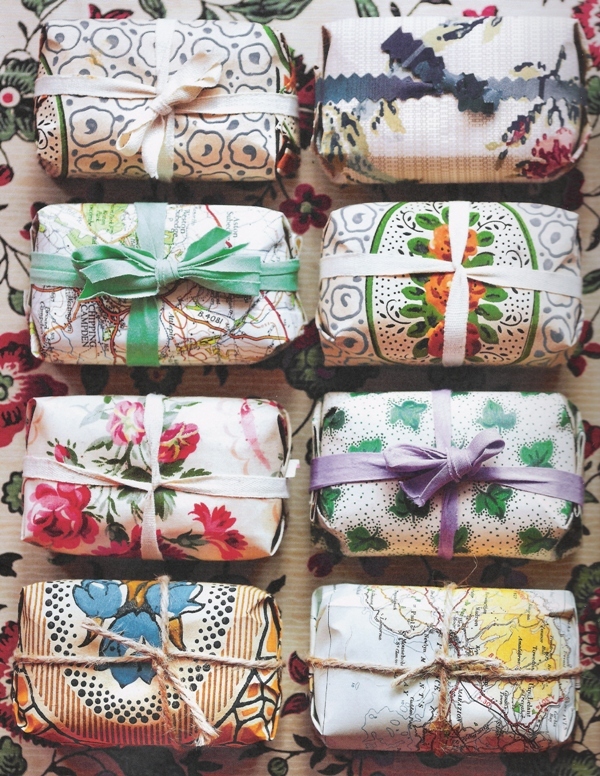 You can use any wrapping paper, out-of-date map of even fabric to wrap your favourite scent and size of soap. Squares of handcut soaps work well, or simply buy family packs from the chemist or supermarket. Pretty ribbon, thick string or bias binding all make lovely trimmings. You can add more embellishments such as buttons, sparklings, paints… but if you find lovely wrapping paper of fabric, that will be just enough. 1 Cut the piece of paper or fabric just large enough to fit around the soap. Place the bar on it and wrap it up like a neat present. Tie ribbon around and knot it in a bow. Add a little tag with a handwritten note explaining which type of soap is inside if you like. 2 Wrap up lots of soaps in all sorts of different combinations and give them as little thank yous or bundle them together and pop them into a basket with some apothecary bottles of shampoos and bath oils.